BOSTON — Patriots defensive end Rob Ninkovich uncharacteristically missed the first day of training camp. Then he missed the second day. And the third. After New England officials announced a mystery news conference for the next morning, most had guessed the reason: The Patriots most versatile defensive player of the past eight seasons had decided to retire. Many Patriots’ players and coaches attended the announcement, including quarterback Tom Brady and head coach Bill Belichick. The room was so packed with players, coaches and media members that Belichick had to sit on the floor to witness one of his most important players hang up his cleats. Ninkovich’s career began in 2006, when he was drafted in the fifth round by the New Orleans Saints. A serious knee injury nearly derailed his career, but he bounced back and forth between the Saints and Miami Dolphins, getting cut four times before making his way onto the Patriots training camp roster in 2009. He was the last player added before camp. Ninkovich became a stalwart on the Patriots’ front seven, spending time at both defensive end and linebacker in both three-man and four-man defensive fronts, exemplifying his versatility. Since 2009, Ninkovich is one of just two players, Julius Peppers being the other, to garner at least 35 sacks, nine forced fumbles, 10 fumble recoveries and five interceptions. 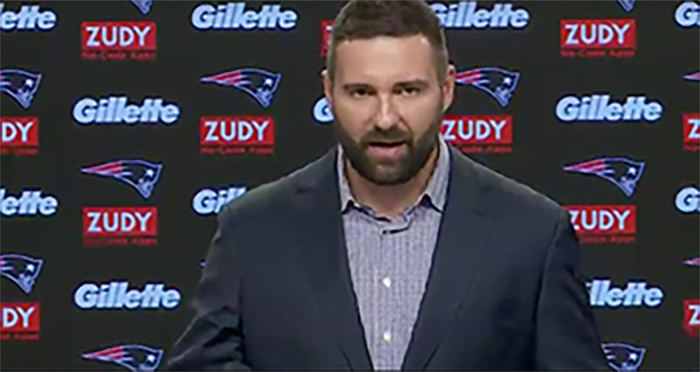 As the announcement came to a close, Ninkovich got teary-eyed when he looked at Belichick, sitting on the floor.